English vs Western, Whats the Difference? Guests often ask us what the difference between English and Western riding is, but the answer often isn’t as straightforward as they would like because there are many similarities between the two schools. One big difference is the saddles used in each discipline and why they are used. Western saddles are designed for comfort and utility because they are a working saddle. Cowboys would spend their entire day in the saddle, and so their saddles were made as comfortable as possible while still giving them plenty of places to tie their ropes, and hang their guns. The most prominent feature of the western saddle is undoubtedly the horn. To the surprise of most novice riders, the horn is not a handle or place to rest your hand. The horn is used to dally(wrap) your rope around when catching cattle, dragging objects on horseback, tie things to, and for many other uses. Western saddles typically have high cantles, and pommels, which create a deeper seat to help you stay secure at faster gaits over uneven terrain. They also have large fenders which keep the stirrups from moving around unnecessarily. Saddle bags, tied on behind the cantle, are a common accessory for holding things while you are out on the trail. We provide pommel bags for our guests, which slide over the horn and secure under the gullet for holding lunches, water, cameras, and anything else they would like to take out on the trail. 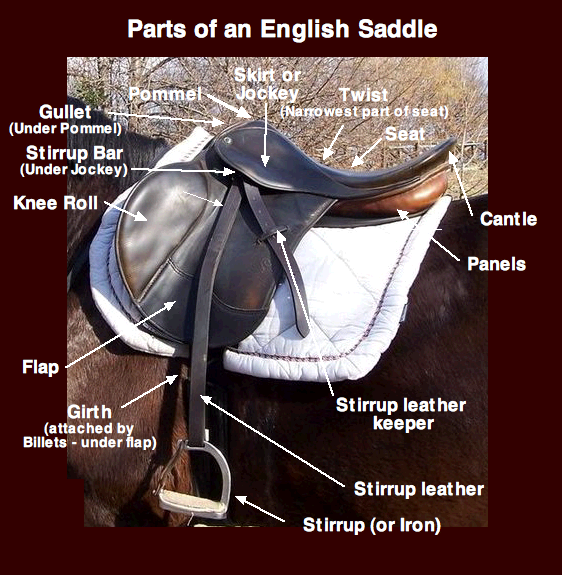 English saddles are much lighter and have fewer bells and whistles than their western counter-parts. There is less leather between you and the horse, and therefore you can ‘feel’ the horse more. The lack of additional leather also gives you more mobility so you can maintain the proper posture for jumping. The stirrup leathers are very thin, so it is very important to keep your weight in your stirrups so they don’t flop around. There are many other differences between the two disciplines from the typical clothing that is worn to the bits and reins used. One style is not better than the other because they are both trying to accomplish different things. If you are an English rider looking to be exposed to the Western style of riding, or if you have never ridden and you think that you would like to try Western riding, Goosewing Ranch is a great place to test it out and see if it is for you!